Today I'm writing in a coffee shop with a view of the old city hall. The farmers market is set up with lots of stands offering delicious veggies, fruits, fish, meet, chesse and scented flowers. The smell of deep fried fish and spices is in the air….ah, life is good. Ok now back to blogging…My first blog, which was about vision boards….would show up on page 2 of google after only 3 months, which was a real achievement…Ok, now I would love to share with YOU what I learned and why blogging ins helpful for your business. Over the last few years I have participated in lots of classes, seminars, mastermind groups and so on, enjoying the chance to connect with many people who desire to have a more global business presence and live their life purpose, doing the work they love to do. After talking to lots of wonderful human beings…I now have a good picture about the most common problems, when starting and/or growing a business online. So what do you think are the most common problems when starting a business? Yes you are right, you need to find customers, so you have to be visible and no…they don't come out of the blue, even if that’s what some law of attraction gurus tell you. Believe me I tried this strategy for a long time and it did not work. Unfortunately you need to apply certain actions and strategies to be found… otherwise you will get lost in the jungle of other websites. Your potential client has no idea that you are out there with your wonderful service or product. As a result you might think that nobody is interested in what you have to offer……but it might just be a problem of being visible. Just to throw this in as a sidenote: People sometimes don’t do the necessary actions, but are unconscious about the fact that they don’t do them. The result is that they think… their efforts are not working…… This process is unconscious and it’s a mind strategy to keep you safe, within your comfortzone. Do I hear you say? This is crazy? Yes it is…but it’s true……. Try this experiment, be mindful and watch yourself…. Being aware of it myself and many other coaches I talk to, I actually noticed myself doing this…. I hate to admit… Has this ever happened to you? When starting or growing a business, one of the most important things you need to do in order to become known and attract customers is to create visibility. Most of you know how to do it for your brick and mortar businesses… Advertise in the yellow pages, gazettes, magazines, word of mouth, go to networking events and the whole shebang. But what about online? If you follow the online marketing gurus, which I did, they all say: start a blog and write posts….. Oh my… how to set up a blog, write, social media….No clue what to do, so many options, don’t know where to start. I was in total overwhelm. Now what are the technical benefits? By writing blogposts on a regular basis, Google will think your website is more active. With every indexed page (new blogpost) you add, there is one more chance to show up in the search engines, so it’s a fantastic tool to create organic SEO and drive free traffic to your site. I will not get into SEO, but websites like hubspot, or other experts will be a great source of more technical information. Just google experts in SEO and you will find great information, even for free. My worpress site also has a great Plugin to help with SEO. 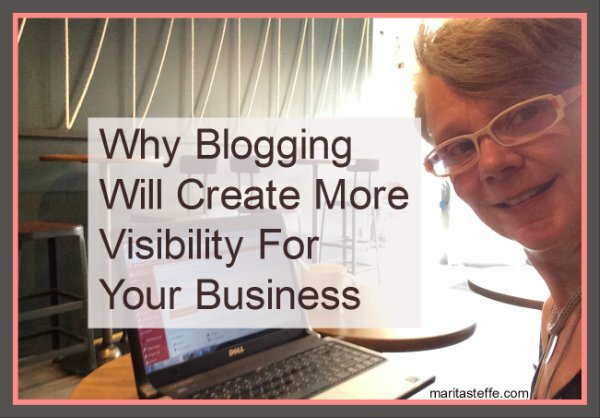 The blog content will be available for as long as you have your blog, so if people are searching for something you write about, it will take them to your blogpost, even years after you wrote it. The other great benefit is that you have your own original content to share on social media, so if people get to know you through reading your blog they start to trust you and if you engage enough they eventually convert to customers and clients. Write about subjects that helps solve their pains. Yeah, it’s always about that, you have something…. they need this something and boom, if the 2 connect it can be a match made in heaven. Write what you are interested in, be personal, make it fun to read. Nobody likes to read boring "manuals". You will need a weblog, social media setup and a good linkedIn profile and if you use it regularly it will create interest and customers for you, the key is to post on a regular basis, not once a year, that would not be enough. If you don't know how to do it get help, get a coach, a tutor, or start a mastermindgroup. Find out about your client's pain and write about a solution to this pain or challenge. Now you have an interesting subject to write about, something that your customers are interested in. First you find a good theme, then you need a great title. What would people google who have this pain? Your title should reflect the answer to this pain, so do some research on google. How to find a great title for your blog. Let’s say your customers are women over 40 who are looking for a new life direction. What would their problems be? They might have an idea what they are passionate about, but they don’t know how to realize it. They feel stuck, they might be afraid to leave their comfort zone, or their environment might not support them. Ps: I love to go write in different cafes, or at the library, it’s stimulates and inspires me to have people around, plus it’s more fun.